For the last week or so, I’ve been working on MMORPG Tycoon 2’s retro-style map; trying to bring a simplified vector graphic look to the interface, for use in most high-level views of the world. I can render the full generated world no problem, but it’s a little awkward to work with, particularly when you need to present localised information about what’s going on in various parts of the world. This view is showing an overview of a level. The various large polygons are showing the different large regions of my MMO (each one is about one or two square kilometers). 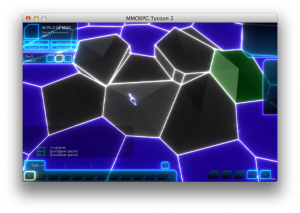 The green region is “switched on” and accessible to PCs in the game, whereas the black ones are not yet active. The blue are (unsurprisingly) underwater, and also inaccessible. I find that I’m enjoying this sort of view; it feels like a nice incremental refinement over the 2D map view from MMORPG Tycoon 1, where here the regions are visibly 3D, but only subtly so. In addition to purchasing regions to use within the game (similar to how one can purchase extra property within other Tycoon games), this map is also fully editable — you can make high areas, lift regions out of the sea (or submerge them again), make cliffs between regions, etc. This isn’t yet feeding back into the generated terrain mesh yet, but that’s my next step. And the mouse interface for editing the terrain still needs a lot of tweaking, particularly around creating and removing cliffs between regions! But I think it’s looking very promising so far! 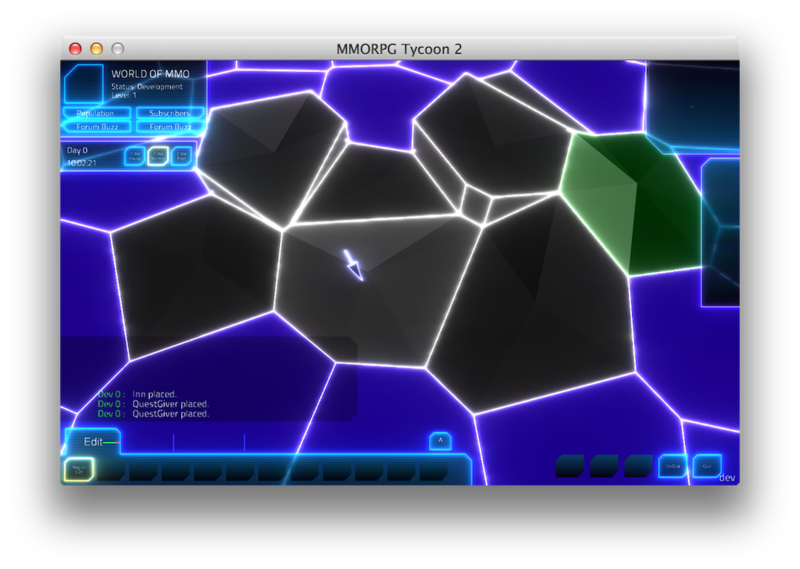 26 August, 2013 in Full Games, MMORPG Tycoon.